The M600 was truly created to minimize setup time, and get the pilot in the air as soon as possible because it features a new way of operating that already has much data and information pre-programmed into the flight controller. This is definitely the most powerful program that DJI has ever produced, yet the easiest to use. The Matrice 600 is a perfect drone for serious professional aerial photography and film making. The M600 can handle most camera setup up to 6000 grams. This means that it can easily carry any of DJI’s Zenmuse cameras, DJI’s Ronin MX gimbal – or even a RED Epic. The Matrice 600 exploits DJIs new A3 Flight controller, which works synchronously with Lightbridge 2 advanced video transmission. This feature allows the drone to produce HD live streaming from as far as 5000 meters away. DJI’s live video transmission technology is second-to-none, as everyone close to the drone industry knows. This isn’t a problem with the Matrice 600. Everything related to flight and camera control on this drone has been rigorously tested and tweaked. That’s because the DJI Matrice 600 is not an untested kit, unlike most other commercial drones. This is an honest-to-goodness RTF commercial flying platform. It comes complete with a flight controller, flexible cargo bays, an onboard redundant-GPS autopilot, video transmission system, propulsion system, a great mobile app, a dedicated remote controller and rechargeable batteries. Also, the new A3 Flight Controller automatically adjusts flight parameters based on your latest payload configuration. On top of that, the drone has even got internet connectivity. This means that you can stream video straight from the camera to YouTube! The Matrice 600 is another amazing product by DJI, and it is designed to be modified for a wide range of commercial and industrial uses. The Matrice 600 is DJI’s new drone aimed at industrial applications and professional aerial photography. The system itself has a maximum payload of 6000 grams. This means that you can carry multiple imaging sensors – IR, NIR, FLIR or even LIDAR, which is perfect for aerial mapping and surveying. Owners are also going to be excited that the carrying weight allows it to fly the incredibly awesome Ronin MX. This is the DJI’s newest handheld gimbal with aerial three-axis ability. The M600 is built to be compatible to a wide host of powerful DJI technologies, such as intelligent batteries, battery management system, the A3 flight controller, and the Lightbridge 2 transmission system. Power is supplied by Intelligent Batteries courtesy of DJI themselves. Also, the customized battery-management system allows for the user to simply push one button and keep flying if any of the batteries fails. The M600 will fly up to 36 minutes, even with a Zenmuse X5 camera attached. If hauling a larger camera the drone can stay airborne for about 16 minutes. The propulsion system is completely dustproof. This amazing feature simplifies maintenance and increases durability. The landing gear is retractable. This means that you are getting true 360-degree unobstructed imaging when you are mid-air, with absolutely nothing in the way to block the killer images you want to shoot. Also, the M600 has motors that are actively cooled, which ultimately provides a flight that is more reliable and stable. What was truly anticipated about the M600, and sets it apart from other controllers, are sine-wave driven. These are very intelligent electronic speed controllers to ensure accurate performance, and that all manoeuvers are carried out safely and efficiently. Self-adaptive flight systems are also on board. They automatically adjust parameters, based on the payload you are taking on for the flight. On the software side, the M600 features DJI’s two SDKs and onboard API. They make it easy for your developers to deploy custom mobile apps and to script advanced flight controls for almost any requirement. Also, the drone’s flexibility and programmability make it easy for professional drone operators to develop unique, reliable and inexpensive UAV solutions for many vertical applications. 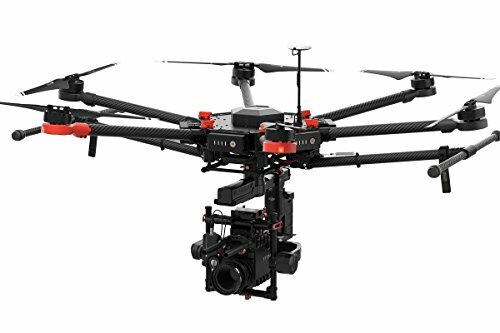 That said, the DJI Matrice 600 is a serious commercial multi-rotor UAV that stands apart from other “prosumer” drones by its far greater payload, a 5000 meters range, a more stable and redundant 6-rotor configuration and broadcast-quality live video streaming. The M600 is DJI’s most powerful commercial flying platform to-date and it can be used in many ways. The M600 is a fully-tested and integrated aerial camera system that offers a far more refined flight and camera control system than almost any comparable multi-rotor offered by a commercial drone manufacturer today. DJI offers two SDKs for developers to customize the M600 for commercial use: one for building mobile apps, and another for interacting with the Onboard API. Developers can build niche-specific mobile apps for a wide range of applications pretty easy using DJI’s Mobile App SDK. The Pix4D app lets you plan your camera shots using GPS waypoints, and then flies the drone automatically without pilot intervention. This app turns your drone into an efficient autonomous mapping and imaging system for utility wireline inspection, law enforcement, land surveying, crop/herd monitoring, and many other industrial applications. This app turns the M600 into a “smart drone” that can be controlled using your tablet computer or Smartphone. DroneDeploy lets you plan mapping/surveying flights directly onto Google Earth maps and transforms your drone into a powerful mapping machine. You can monitor and control your M600 from any system that is wired directly to the DJI flight controller by interacting with the onboard system’s API. Autopilot apps: You can tell your drone how and where to fly using either visual sensors or onboard GPS to navigate. Custom flight commands: Work with a single keypress – camera positioning; aerobatic maneuvers; return home flight paths (or hover in place); and more. Informatics and Avionics apps: Help gather information from the entire system in real time. Battery life is one of the key factors taken into account when buying a drone because the longer a camera drone can stay in the air; the more chance you have of capturing that perfect moment on film. When it comes to endurance the Matrice 600 is seriously impressive. Six DJI Intelligent Batteries not only provide power but also a redundancy if one fails. This feature allows you to focus on the task at hand without worrying about your beautiful new rig falling out of the sky. As far as hovering time, you are looking at about 36 minutes with six batteries and 16 minutes with 6 kg payload. To keep those batteries fresh, the charger model is the A14-1000P1, the voltage is an output of 26.3 V and the power rating is 100W. The M600 has dual parallel CAN ports for connecting other DJI devices, including the RTK GPS units and Guidance sensor system. The Matrice 600 is an extremely flexible platform. It features several expansion bays provided to hold components, payloads, sensors and imaging devices. Also, you can support complex payload configurations without touching the hardware with dual parallel CAN and API ports. To optimize functionality and weight balancing goals place your components exactly where you want them. The DJI Matrice 600 comes with a customizable long-range controller. The flight controller uses a rechargeable battery and has an operating range of up to 5 km (3 miles). When the Matrice 600 arrives at your door, it comes seamlessly integrated with the A3 flight controller. The A3 flight controller is specifically customized for this model. If needed, you can upgrade to the A3 PRO system. The A3 Pro enhances the reliability and stability of the Matrice 600 by providing redundancy during breaches of interference, or if the GNSS or IMU models fails. The controller comes with adjustable/assignable controls and video outputs – plus a holder to connect your mobile device. The Matrice 600 comes with an enhanced GPS position system. It offers faster satellite acquisition, more accurate position hold and supports GPS waypoint flight planning. You’ll need the D-RTK GNSS upgrade for centimetre-level precision. The Matrice 600 is compatible with DJI Pilot and DJI Go apps. This is where you get a live video feed, transmission strength, very useful stats on battery and redundancy status, navigation, and other important information during the flight. DJI Go also lets the operator control the camera shutter speed, photo and video capture, and remote focus for the X5R and Zenmuse cameras. However, many Matrice 600 owners will probably develop their own apps using the DJI SDK. All DJI apps run on your choice of Smartphone or tablet device (they are mounted directly onto the DJI Flight Controller). The Matrice 600 can take advantage of DJI’s new PC Ground Control features using the new DJI Assistant 2 app to automate flight and camera controls using GPS and onboard informatics. DJI Matrice 600 is compatible with Lightbridge 2 software so if you are a professional photographer or/and filmmaker you will be very pleased. DJI Lightbridge 2 offers high frame rates and High Definition live streaming (First Person View) and has been designed from the ground up to meet the requirements of professional broadcasting. When using DJI’s Zenmuse Cameras and gimbals, you can increase your flight range and HD video streaming range to 5000 meters by adding the A3 PRO upgrade to the included DJI Lightbridge technology. The M600 uses DJI’s new 6010 motors and DJI E2000 PRO propellers. DJI Matrice 600 has dust proof propulsion systems and actively cooled motors. This feature ensures that the drone will operate effectively without any issues despite the conditions in which are being used. Matrice 600 also uses sine-wave driven. This is intelligent ESCs to ensure it performs accurately, safely and efficiently. When you pair the M600 with the brand-new DJI Ronin-MX, you will get the best three-axis aerial video stabilization you can obtain. The new Ronin gimbal allows your camera to rotate 360°. The best thing is that the camera never locks in place after a full rotation and continues to spin endlessly. Also, the tilt axis ranges from 90° straight down and beyond to 135°. The Ronin cooperates perfectly with the M600, and along with the Lightbridge 2 transmission system and A3 flight controller, you are getting the very first universal aerial gimbal from DJI that efficiently communicates at all times with the onboard DJI flight controller. 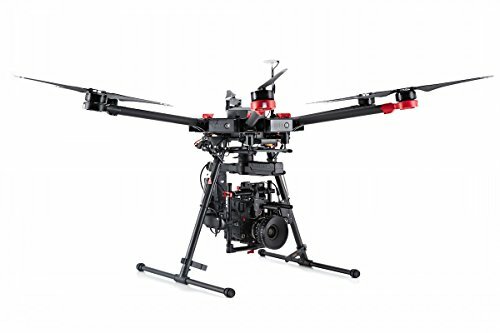 This means that film directors can truly integrate a top-class flight controller, an amazing video-transmission system, and have wide available support for many cameras and gimbals. From action sports to real estate and those who are offering holiday properties, the ability to get cinematic-quality shots is going to open many doors for people. Also, those who view the finished product will be blown away. The Ronin-MX can transmit video real-time from a mounted camera when you partner it with an optional accessory. This feature makes full use of the many capabilities that the Lightbridge 2 offers. There is also a wireless adapter available to mount to the Focus remote. This means that you can have full compatibility with the DJI Focus itself. The Matrice 600 puts to use very intelligent ESC’s to make sure that it’s going to be accurate, safe, and efficient every time you take it up in the air. Also, the flight systems are able to self-adapt into flight parameters based on the payload you are carrying. You can upgrade the A3 GNSS system with DJI’s Real-Time Kinematic technology to get centimetre-level accuracy. Using dual antennas, its heading reference is more accurate than a compass sensor. Also, it is able to withstand magnetic interference from metal structures. With diagnostic algorithms that compare sensor data from the three sets of units in real-time and triple modular redundancy, the A3 Pro ensures that the Matrice 600 flies exactly as expected. This redundant system is perfect for filmmaking and industrial environments because it ensures professional reliability. DJI Matrice 600 integrates a Zenmuse camera and gimbal. However, it is also compatible with Ronin-MX gimbal and a range of other professional cameras from Micro Four Thirds systems to the famous RED Epic. You can attach practically any professional camera and gimbal to the M600. 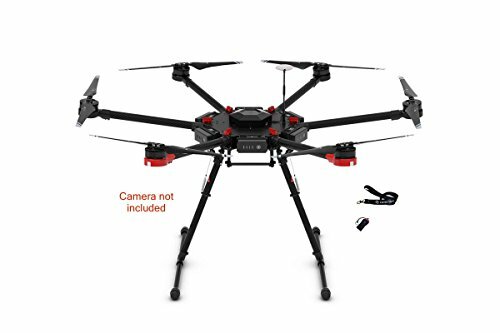 This feature makes it the perfect camera drone for professional purposes together with the best and most recent UAV technology. DJI MATRICE 600 PRO Flir Vue Pro 336HZ 13mm Zenmuse z3 zoom 4k camera RMUS Raptor gimble Test build and flight. 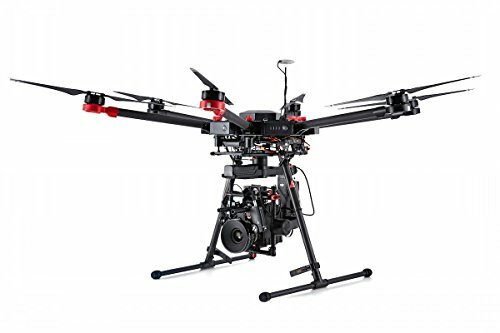 The DJI Matrice 600 is designed to give the owner freedom to choose exactly what kind of camera, gimbal, and accessories they want to use for the footage they envision. The M600’s capability to carry heavy cameras and accessories while still maintaining stability and steadiness in the air is its big advantage. 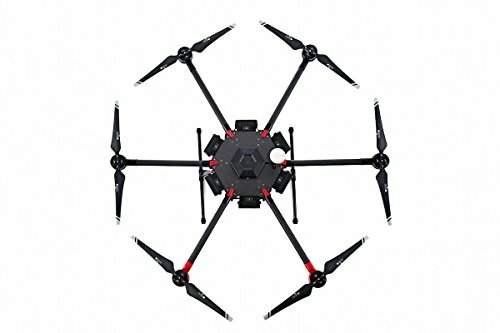 The drone’s six rotors and batteries are a highlight of its design. This amazing feature gives users added safety in flight along with an extended flight time. Another bonus is that the M600’s system can seamlessly integrate with DJI’s full range of Zenmuse gimbals and cameras, without being restricted to one camera or one system. The upgradable A3 system is also a never before seen feature. It adds extra accuracy, precision and reliability to the system. The DJI Matrice 600 is a game-changer for any industry professional looking to create the next Hollywood blockbuster and DJI has once again showcased why they outpace the competition.